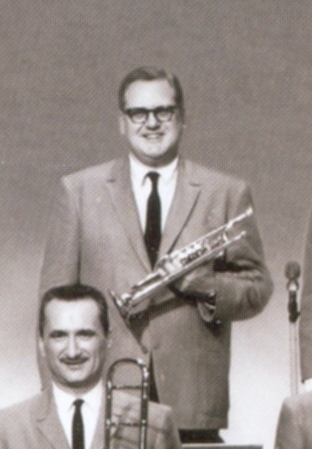 Ray Linn played the trumpet on the Lawrence Welk Show from 1968 to 1969. Linn was born October 20, 1920 in Chicago, Illinois. Linn's first major engagements came while he was a teenager in the late 1930s. He played with some of the best out there including Tommy Dorsey (1938-41) and Woody Herman (1941-42). He returned to play with Herman again several times, in 1945, 1947, and 1955-59. In the 1940s he also spent time with Jimmy Dorsey (1942-45), Benny Goodman (1943, 1947), Artie Shaw (1944-46), and Boyd Raeburn (1946). He moved to Los Angeles in 1945, where he worked extensively as a studio musician, in addition to playing with Bob Crosby (1950-51), Les Brown and another tenure with Woody Herman before joining the Lawrence Welk Orchestra in 1968. After leaving the Welk Show in 1969, Linn continued performing with other notable musicians including Maynard Ferguson, who despite his many alcohol and drug addictions, was one of the finest trumpeters of the 1970's. Other notable credits include the movie "Spartacus", the "Steve Allen Show", "Dinah Shore", Louis Armstrong and Diahann Carroll. In 1972, Linn joined up with other fellow Welk Show alumni such as Al Hirt, Henry Cuesta and Bob Havens to form the Chicago Stompers group. Linn passed away in 1996.